The leafcutter bee belongs to the Megachile family of bees, and is another useful friend to gardeners as it provides a valuable and efficient pollination service for plants. Surprisingly, in research, they discovered that about 150 of these little bees working in greenhouses (or similar) can provide the pollination service of 3,000 honeybees! Like mason bees, they are ‘cavity nesting’. 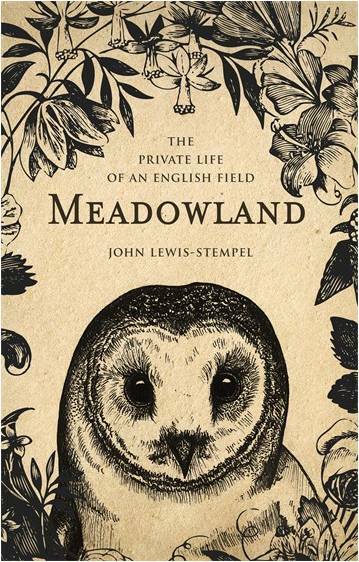 This means they like to make their nests in ready-made cavities or in soft rotting wood that can be ‘excavated’. Once a suitable spot has been found, they will build cells using the pieces of leaf as lining, by overlapping segments of leaf to make a cylindrical cavity that looks a little like a cigar. Each cell is sealed up with a little segment of leaf. In parts of Europe, some species line their egg cells with petals instead of leaves. Nests are small: only around 4 to 8 inches long. Below is a small amount of video I managed to capture, of a leafcutter bee female carrying a segment of leaf back to her nest. It's a very short clip, because having positioned the solitary bee house, I then proceeded to put heavy pots and plants in the way, meaning I had to lean over, thus making it difficult for me to sustain filming for a long period of time, so that most of my video clips were very shaky and not at all very good - a bit of bad planning at the time on my part! But anyway, the segment of leaf is grasped and carried below the body of the bee, and transported to the nest. Some leafcutter bees will also use petals, such as the silvery leafcutter bee, which may use the flower petals of bird's foot trefoil. Below is another species of Leafcutter bee: the Carpenter-mimic Leafcutter bee, Megachile xylocopoides. The video was kindly supplied by Tracy L. Elfers of Florida, and it shows just how versatile, adapable and opportunistic some bees are. It has constructed its nest cells among a collection of letters and envelopes! Instead of relying on a pre-constructed tube or tunnel, it has created its own using segments of leaf, although the letters do form a kind of 'cavity' that support and shelter the bee's construction. 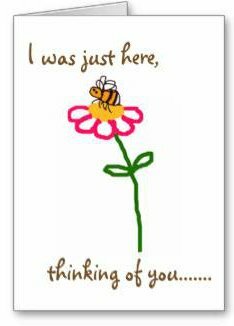 The whole process of the bee arriving with a piece of leaf and depositing it into her cells takes about 3 minutes. Note, Leafcutters always cut away segments of leaf in a very neat fashion. Jagged cuts or rips in leaves are nothing to do with leafcutter bees. What happened here? The tube to the right is sealed off with green leaves. 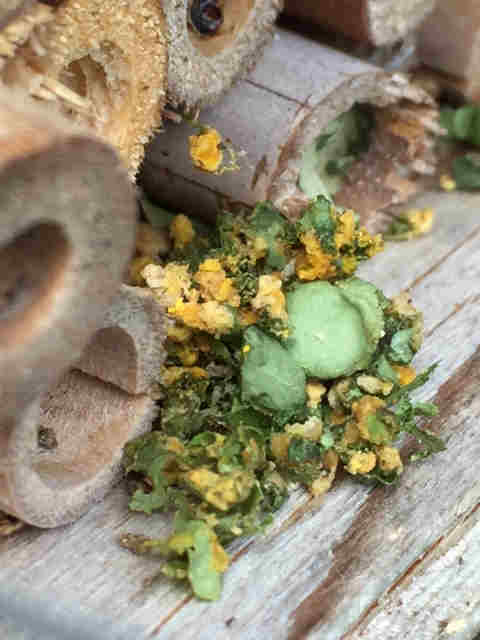 No other tubes have been filled in this bee box by leaf cutter bees." "Remains of leafcutter bee (Megachile) cells. Sometimes female leafcutter bees clear existing nest sites to make space for their own cells." I was then told by Steven Falk (author) that it was a form of 'usurption'. 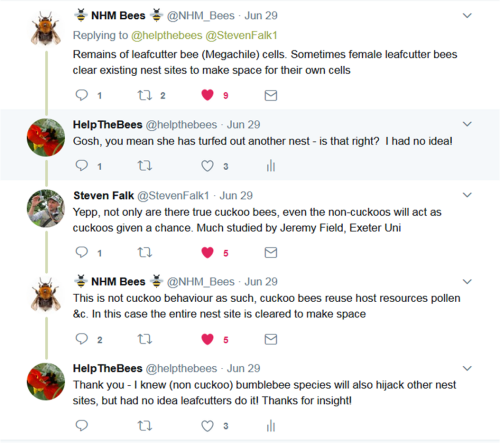 I was aware that usurption can happen in bumblebees, (true bumblebee queens may fight over nest sites - this is different from cuckoo behaviour) but had no idea it might be seen in leafcutter bees. Well, you learn something new every day! The newly emerged females begin constructing nests after they emerge in Spring. In each cell they will lay a single egg, and supply it with pollen upon which the larva can feed once it hatches. The larvae pupate and develop inside these cells. They will over-winter in their cells as mature larvae, and emerge as adults the following spring or early summer. How do leafcutter bees differ from honey bees? 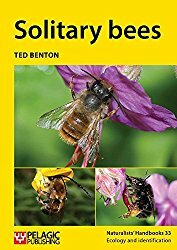 On first sighting, many species of solitary bees can easily be mistaken for honey bees or even hoverflies. So how can you tell the difference between honey bees and leafcutters, if the leafcutter is not engaged in the activity of cutting leaves or building its nest, but instead, is foraging on flowers? 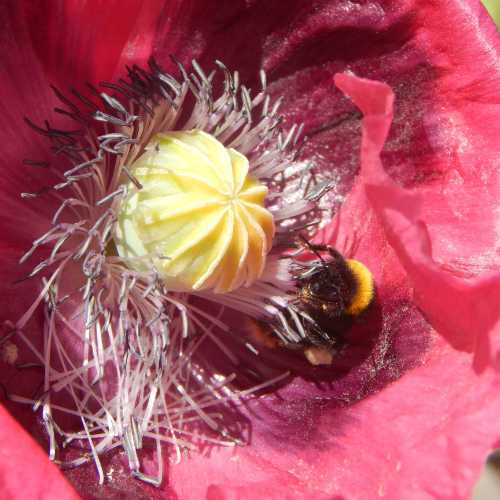 One give away lies in their methods for collecting pollen. Worker honey bees, like bumblebees, collect pollen in their pollen baskets or ‘corbicula’ on the hind legs, then transport it back to the hive or nest. 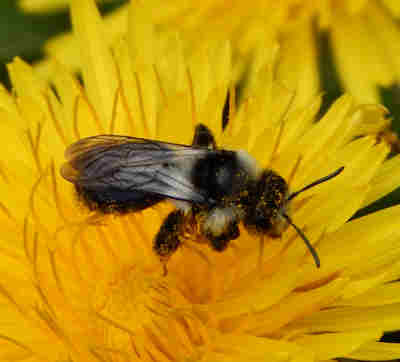 Leafcutter bees do not have pollen baskets on their hind legs. 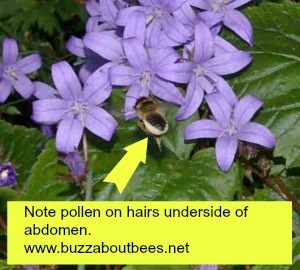 Instead, they collect pollen on hairs on the underside of their abdomens. When the bee is carrying pollen, it is quite visible as a pale yellow colour. See the photograph below. The photograph above of Megachile centuncularis was taken in my garden. This leafcutter is foraging on a particular variety of low growing bedding campanula. Have you ever noticed neat little segments cut away from roses, lilac or other shrubs? 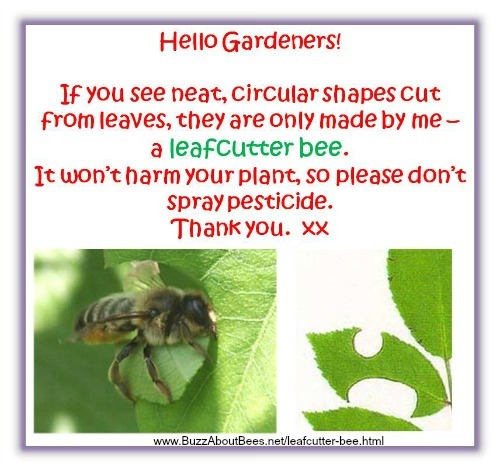 If it’s leafcutter bees, there will be a crescent or almost circular shaped hole in the leaf. If you should find this, do not worry, usually it will not harm your plants, although rarely, you could see a fair amount of damage, but this is not the norm. Plants can usually survive a little damage. (Remember, plants survive pruning and dead–heading!). So, please don't spray your plants with pesticides! 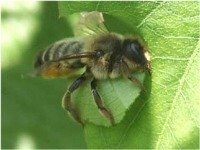 Lots of people would like to be able to watch leafcutter bees in action. They are rather docile, not aggressive (although I always suggest it's best to avoid handling them, rather than put them under stress. Better to let them get on with what they are doing, and observe them from a little distance). It’s possible to encourage them into your garden by providing bundles of hollow canes, or a log of wood drilled with holes around 1cm in diameter (don’t use varnish, preservatives or any other chemicals). I have had great success with a bug house sited against a sunny fence. The first one I had was purchased from a garden store. However, I decided to make further provision for them in my garden, with hollow canes, again with great success. If you do not have time to make your own bug house, or if you like the idea of providing a gift for a friend or loved one that will help bees, as well as provide hours of entertainment (and gardening value! 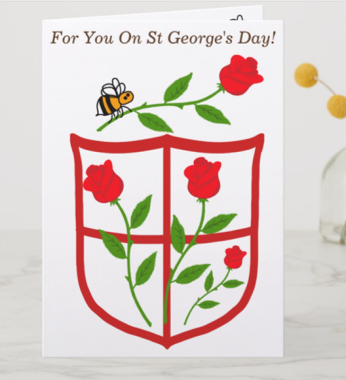 ), you may prefer to purchase a bee house instead. I received a large insect/bee house as a Christmas gift, and have had great success (actually attracting mason bees on this occasion). Attracting leafcutter bees to the garden is very rewarding. They are fascinating to watch, and in a way, amusing: to see a little bee carrying a piece of leaf as large as itself, or even larger, is wonderful to see! Find out about Mason Bees. 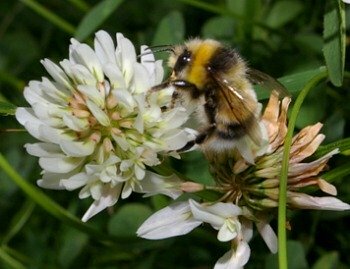 Learn about the key differences between solitary, bumblebees and honey bees.